Last week I reported about how Kobo and Borders had reorganized their partnership, and that it looked like Kobo were going to put their logo on the Borders ebookstore. Ithought they were doing this to buck up the investors and reassure everyone that Borders owe money to (collectively known as "the publishing industry"). It looks like I was wrong. Kobo didn't just put their logo on the site; they took over the Borders ebookstore completely. Borders are out of the ebook business. If you try to buy an ebook from borders, you'll get the pop-up window at right. Before you buy the ebook you'll have to transfer your account to Kobo. This is worse than I thought. It's not a measure to prop up Borders; Kobo are planning ahead for the inevitable collapse. If you've bought ebooks from Borders, I would go there now and move them over to Kobo. Do it now, before it's too late. The real prize will be Border’s customer data for eBook marketing. Probably the only asset they have. Kobo take marketing very seriously and they literally watch their sales from minute to minute. I’m doing the library transfer. Borders doesn’t tell you explicitly to do it when you sign in. There’s a learn more about Kobo link I followed for the library transfer. Screensnapping and will do a post. I am in a transfer limbo. Waiting for Kobo to email me the damn link so I can change the password I’ve forgotten! It’s been TWO HOURS and I’m STILL waiting for the Kobo email, FFS. They’re as bad as Sony with that! I think that should prove that Kobo weren’t running the ebookstore servers. You’ve lost the plot. Borders got me their email in SECONDS. It’s THREE HOURS waiting for KOBO to get off their maple-leafed asses. Inexcusable! 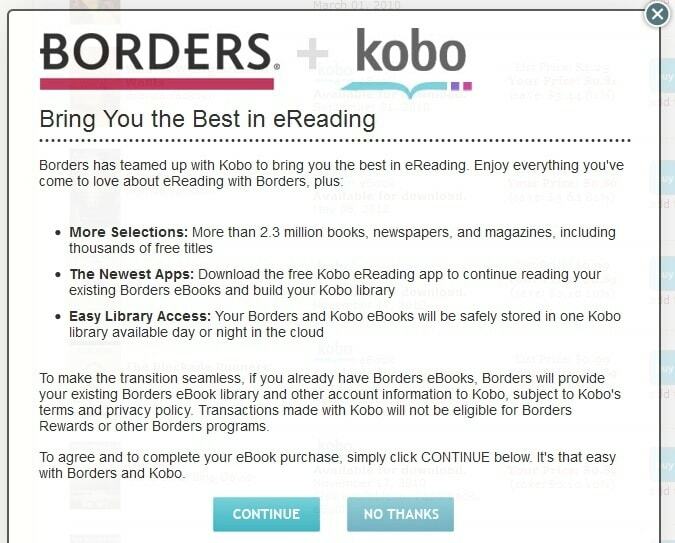 Kobo had already explicitly stated all Borders ebooks purchases were to be fully honoured by Kobo … which was running the Borders ebook store (and has had the Kobo logo on it for months “powered by Kobo”). With so much uncertainty in the market, it probably made more sense to explicitly put all future sales onto the Kobo database directly. The shares of Kobo that Borders owns are an asset which belong to the creditors that is being managed by the court during the bankruptcy process. The court would favour this arrangement as it does not ad further future liabilities. So, win-win for everyone, regardless of how the final Borders situation nets out. “Powered by Kobo” was always there. As closely as Kobo monitors sales, I imagine they have seen the uncertainty surrounding Borders affecting the sales from their Borders branded store. It was always run by Kobo, anyway, so why not take a step to alleviate the customer concerns about their purchases. It just seems like a common sense move to me. It’s not as cut and dried as that and Nate, despite the protestations of Borders in another post, is correct. And if I can ever get my damn books transferred, I could do my damn post and say why! I made the swap last week when I got the email from Borders. It was fairly quick and straightforward. DOH!! That’ll teach me. I have been ignoring the Borders emails lately. All the Subj lines have been about more sales for print books. I’ve been ignoring them as well. They’ve taken on the quality of a death rattle… or, you know, Monty Python’s Black Knight. This one, however, I’m glad I paid attention to. I don’t know how they can afford those sales. The discounts must be all of their profit, if not more. FOUR frikkin HOURS I have waited for Kobo to spit out my damn change password email. FOUR HOURS! Bugger it. Will transfer the effin books tomorrow. IF I REMEMBER! It certainly shouldn’t be taking that long. Can you give it another try? we just tried it and it appears to be functioning. OVER FIVE HOURS LATER and a SECOND request and it finally worked as it should have. That was NOT a good experience. That sounds like a horrible experience, it should not have taken that long, I’m sorry it happened. How long did the second request take? The second request was as fast as my only one to Borders — within seconds.